Built in 1951 by Albina Engine and Machine Works of Portland, Oregon as the Howard (hull #256) for Atlas Tug Service Incorporated of Longview, Washington. The tug was later acquired by the Longview Tug and Barge Company of Longview, Washington. A subsidiary of the Smith Tug and Barge Company of Rainier, Oregon. Where she retained her name. In 1977, the Smith Tug and Barge Company was acquired by the Knappton Towboat Company of Astoria, Oregon. Where the tug was renamed as Rainier. In 1993, the Brix Maritime Company was acquired by the Foss Maritime Company of Seattle, Washington. Where the tug was renamed as the Cabrillo Foss. In 2005, the tug was later acquired by Pacific Tugboat Service Incorporated of San Diego, California. Where she was renamed as the Cabrillo. In 2013, she was acquired by the Sea and Shore Contracting Company of Randolph, Massachusetts. Where the tug retained her name. Powered by two, six cylinder, John Deere 8.1 Liter, Powertech, diesel engines. With Twin Disc, hydraulic, transmissions. 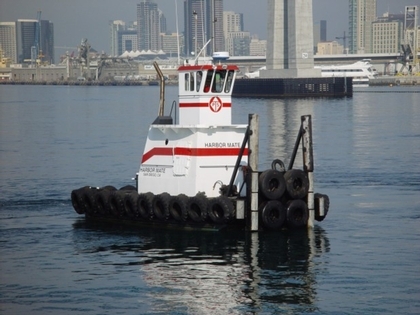 She is a twin screw tug, rated at 680 horsepower.